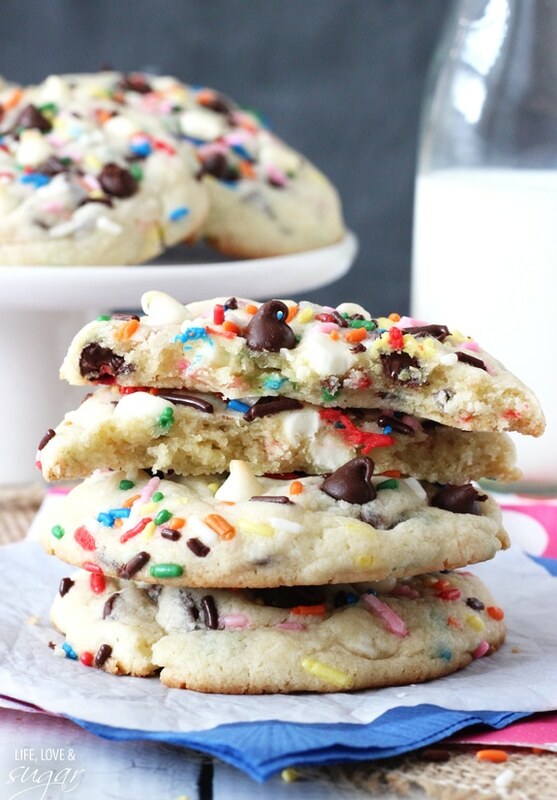 These Funfetti Cake Batter Chocolate Chip Cookies are my very favorite cookies ever! 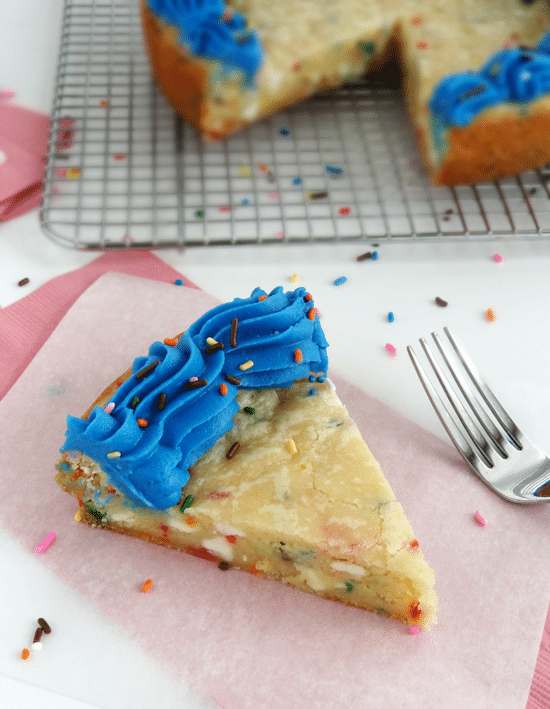 Combine a cookie and cake and you have the perfect dessert! 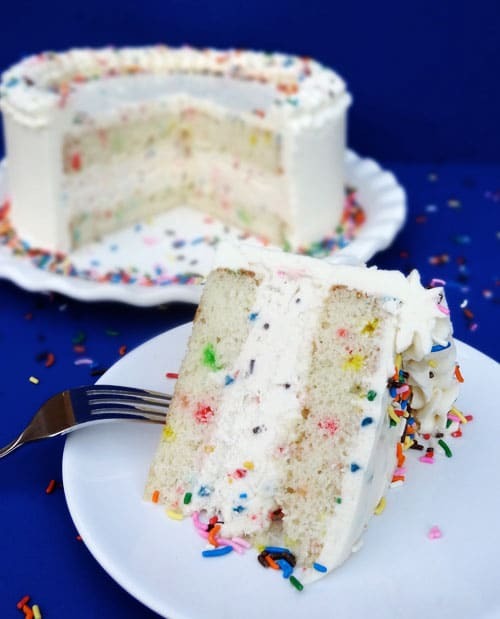 They don’t lack at all on the cake batter flavor either – they use an entire box of cake mix. Equally exciting is that I’ve teamed up with some other bloggers and we’ve got a Back To School giveaway for you today! With all the back to school supplies that are needed every year, we thought we’d help you out. 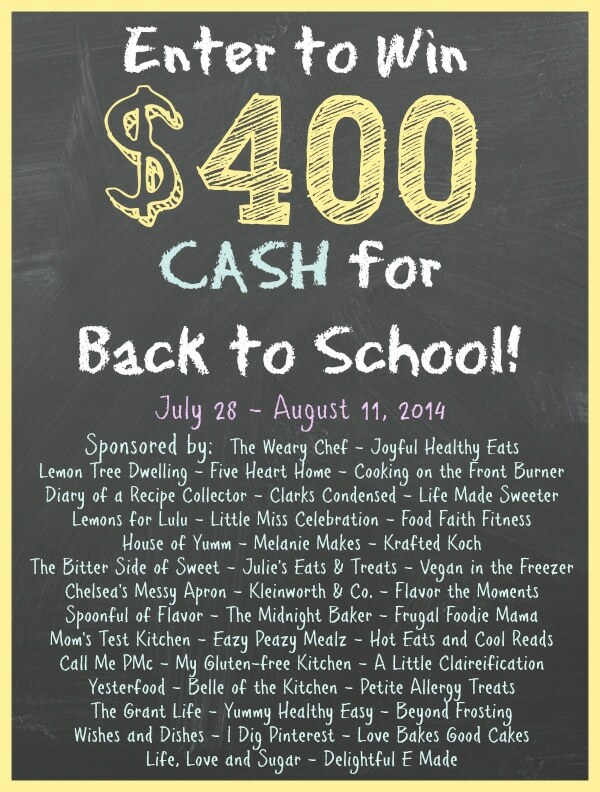 The winner gets $400 in paypal cash towards back to school supplies! Yay! Be sure to enter the giveaway at the end of the post. This weekend we went and visited with my family. It was my mom’s birthday and it’d been a while since we’d been home, so it was great to visit. We arrived with LOTS of cake! Not only did I make fresh cupcakes for the occasion, but my mom likes for me to freeze things that I’ve made to give to her later. I don’t save everything, but I try to save her at least a slice of most things. I had an entire cooler full for her this weekend. I was so thrilled to finally get it out of my freezer – it was taking up two full shelves! I had grabbed a somewhat smaller cooler at first and packed it with the cake and cupcakes, but had to grab a bigger one because there was so much! I call her freezer full of my cakes the “cake graveyard.” It’s where my cakes and cupcakes go to die until revived by her when she wants it. 🙂 It’s actually become a not-so-well-kept secret that she has my treats in there. My younger brother has been known to come by the house and run off with cake that she wanted. He actually took a few pieces of this carrot cake without her knowing one day, and left a couple for her. Then he tasted how good the carrot cake was and went back for the rest. The next thing she knew, she went to get a piece and it was gone! She has officially been re-stocked. We spent her birthday with girl talk over morning coffee – our favorite time together – and then went out on the boat with some other family that came over. The weather was perfect and we ended up anchored and floating around in the water for hours. It was totally relaxing and exactly the kind of day/birthday my mom loves. We finished off the day with a tasty meal and some card playing. We all got so involved in the card playing that it was 3:00 am before we knew it! I don’t think I’ve stayed up that late since college. We didn’t even realize it was so late – I think we could’ve kept going! Unfortunately I didn’t freeze any of these cookies for my mom – I don’t know what I want thinking! 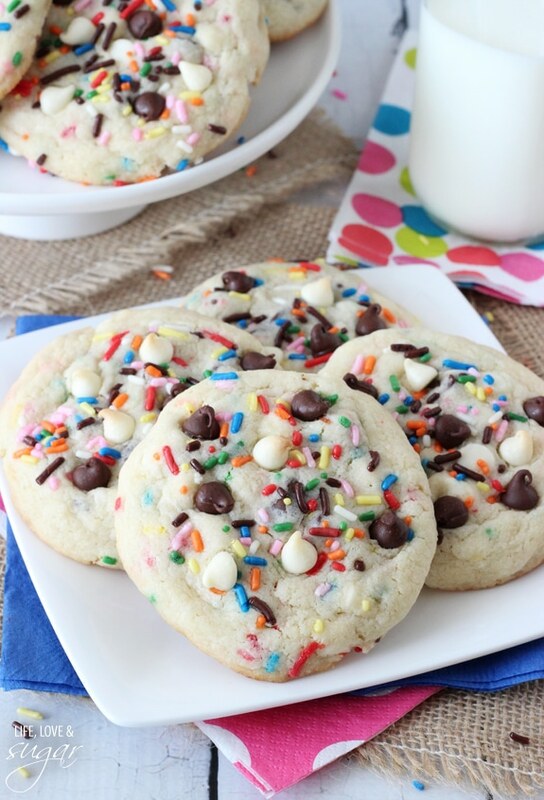 They are absolutely the perfect birthday cookie. In fact, if you want a cookie cake version, I have one of those. Best cookie cake ever! After making the cookie cake, I decided I wanted a cookie as well. So I played around with the recipe a bit and these were born! 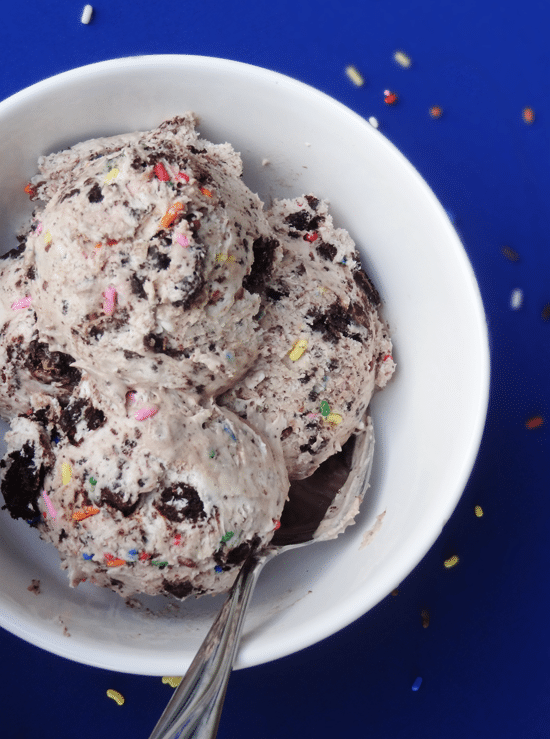 The dough mixes up like a pretty traditional cookie dough, so it’s pretty straight forward. After making my thick and chewy chocolate chip cookies recently, I decided to follow their lead and use my 1/4 cup cookie scoop. I’m loving the big size of the cookies! They do spread a fair amount when baked, so there’s no need to flatten them out before baking. In fact, I left them in the thick disc shape of the 1/4 cup scoop. These cookies don’t require refrigerating before baking, but you certainly could refrigerate the dough if you want to prepare it ahead of time and then bake later. A note: the colder the dough, the less it will spread when baked. 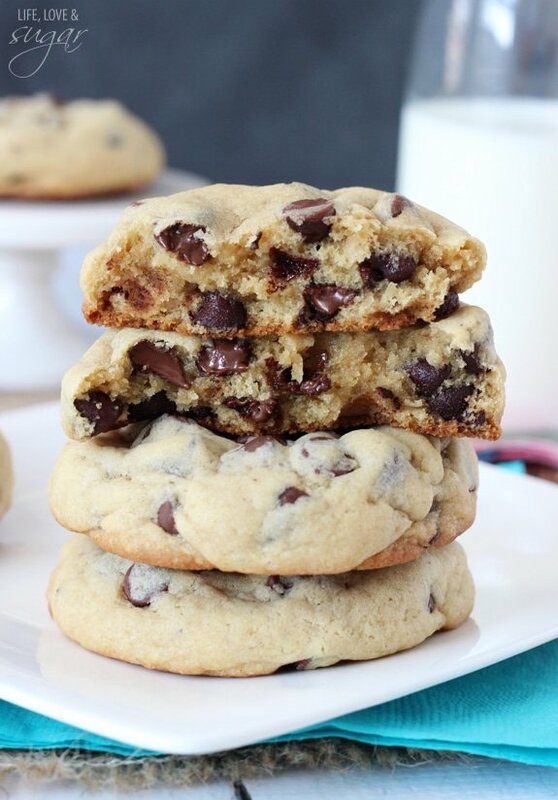 Don’t say I didn’t warn you – these cookies are crazy addicting! 1. Cream butter and sugar together until light and fluffy, about 3-4 minutes. 2. Mix in eggs and vanilla extract. 3. Add flour, cake mix and cornstarch and mix until well combined. 4. 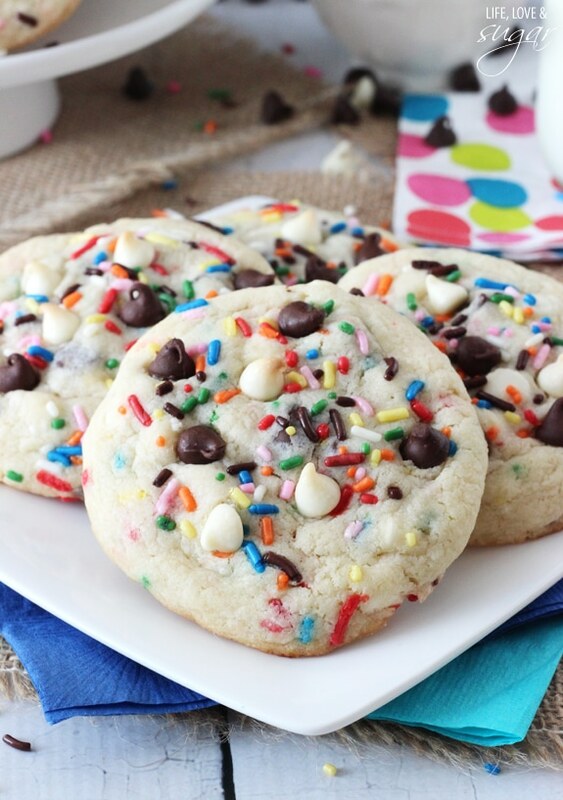 Stir in sprinkles, chocolate and white chocolate chips. Dough will be thick. 6. Measure out each cookie using a 1/4 cup measuring spoon. They should be in the shape of thick discs. 7. 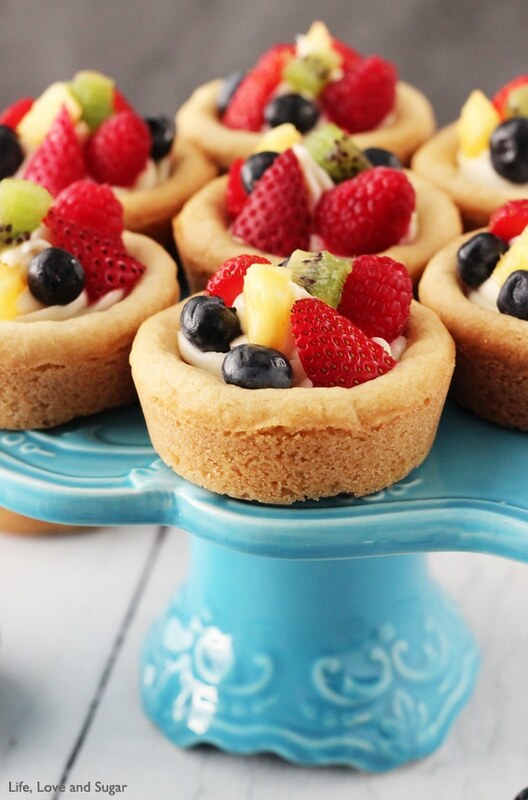 Bake for 11-12 minutes. The center of the cookie will still look a little undercooked, but that’s ok.
8. Remove from oven and allow to cool for about 1 minute, then remove to finish cooling on a cooling rack. I love your mom’s attitude! When mine qualified for the discount, she wouldn’t take it because she had a complex about getting older. I’d rather get the cheaper prices! These cookies are so pretty! Perfect for a birthday. 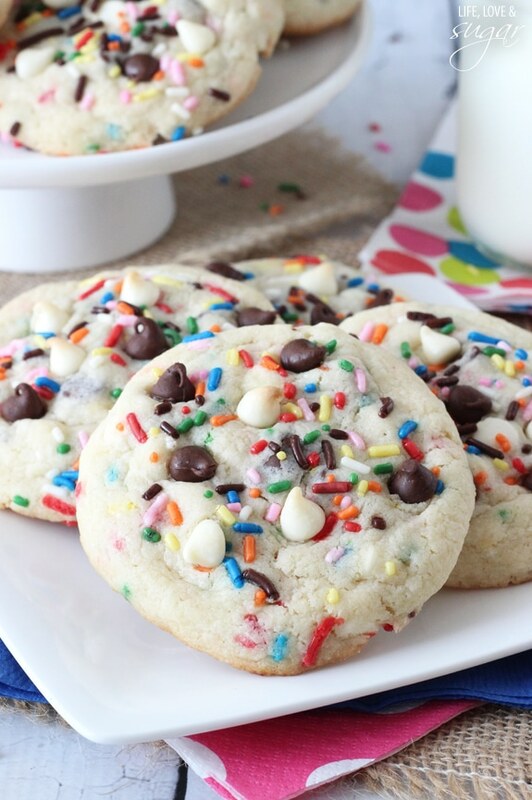 Mmmm, funfetti cookies are so delicious and I love that you kicked it up a notch with chocolate chips! What fun, giant cookies! 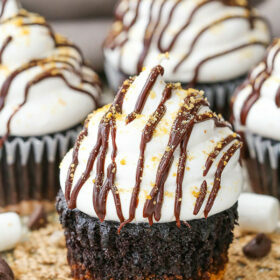 Love that you use two kinds of chocolate! I got such a kick of out of your cake graveyard photos! Sounds like you had a great weekend! Thanks for the link love! That is quite possibly the most adorable thing I’ve heard all day…you stock your Mom’s freezer with everything you bake!?!? My heart just melted. I would be sooooo pissed if someone took my only piece of ANY of your treats! 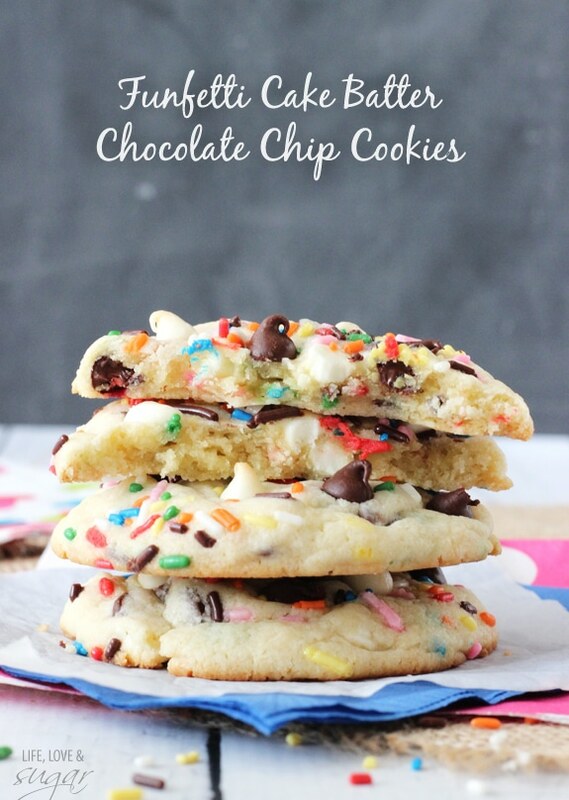 These cookies are no exception! 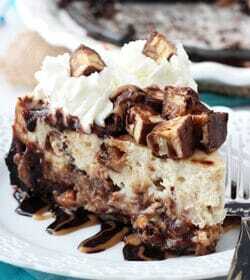 So chewy…I just want to reach in and steal some off the plate!!! love how fun & colorful these are! yum!! I love how you keep a sampling of your treats for your mom! I’m sure she feels loved:) These cookies look amazing and I just pinned them to bake later! Thanks Heather! Thanks for the pin! These are the funniest (yep funniest is now officially a word) cookies I have ever seen! They make me smile and I bet they are super delish! 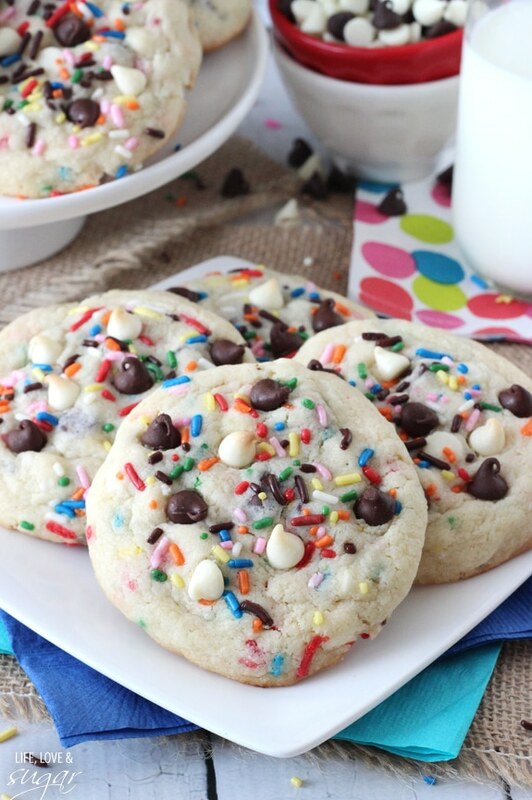 Pretty cookies and so easy! You are right, the dough is very stiff, left my KitchenAid screaming for mercy! The semisweet morsels really make the cookies. What is nice is that they are made from items already in the pantry. 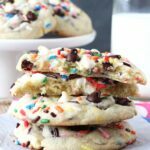 Another winning cookie recipe! Did you use granulated or confectioners sugar ???? 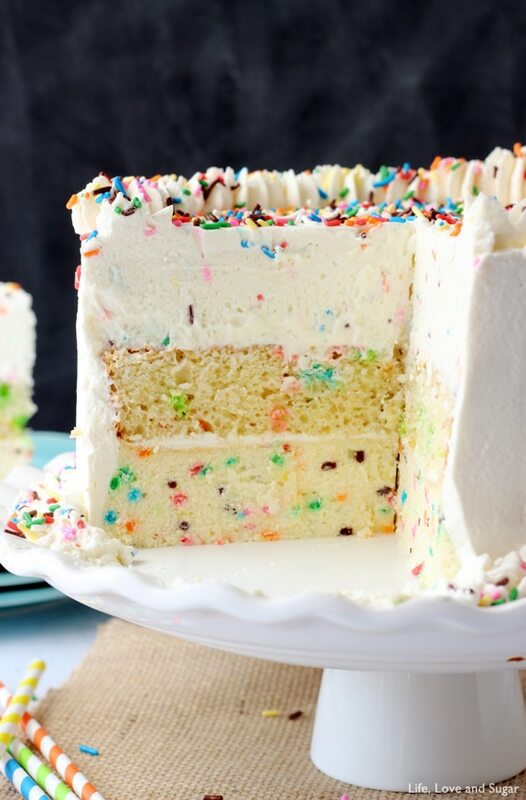 Hi I don’t have funfetti cake mix here (uk) can i use another cake mix and just add sprinkles? Cookies look super yummy can’t wait to try. Yes, vanilla cake mix should be fine.